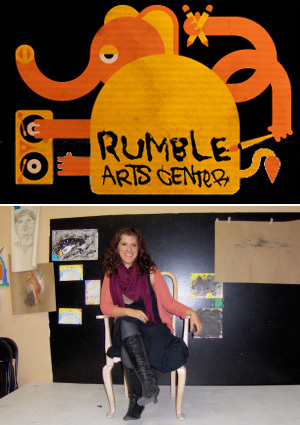 As its logo suggests, Rumble Arts Center's name is taken from a specialized trait of elephants — the contact rumble. Used like Morse code, the elephant's system of rumbling the ground with their feet sends out low frequency signals that reach other elephants miles away. It's become a metaphor for the way Director Brook Wolfe hopes word about Rumble Arts travels, radiating out from their North Avenue epicenter to other friendly, like-minded listeners across the city. Rumble's mission as an all-ages, donation-based multicultural community arts center has expressed itself, in its first year and a half, by hosting dozens of classes, ranging from drawing to martial arts, pop 'n' lock to puppetry, yoga to DJing. The lean and nimble paid staff is composed solely of Wolfe; Edwin Perry, who serves as co-director; and Bree Johnson, Rumble's administrative assistant. A painter and spoken word artist herself, Wolfe was born and raised in Chicago, and lived the same Humboldt Park neighborhood as the Arts Center. After changing majors four times at a total of five different undergraduate art schools she left Chicago for Oakland, accepting the fact that her exposure to multiple teaching methods and styles was a good enough education in and of itself. After moving back from her transformative stay out west, Wolfe took inspiration from the arts program called Art Esteem she had worked with in California, and used it to guide her development of Rumble itself. A family member and Rumble's first board member donated the three-story building he owned, and miraculously, the center had an instant home. The space was wide open and raw, and while professionals were hired for the plumbing and electric work, Wolfe tackled everything from hanging drywall to embellishing walls with mirrored and ceramic mosaics herself, drawing on her experience living in lofts and building theater sets. Volunteers helped out with the rest, painting and building shelves, and much of the building materials were supplied by donation, frequently consisting of salvaged or repurposed items. Aside from an enormous hardwood dance floor with a partial mirrored wall, the second floor also features a small stage and Johnson's desk — an arrangement that literally thrusts part of Rumble's administration out into the open, underscoring their accessibility. The next phase of construction included a complete gut rehab of the ground floor, which opened in September of 2009, in hopes that rental fees of the space could directly fund operating costs. Along with another hardwood floor, the white, pressed tin ceiling is ribbed with gallery grade track lighting, and a white baby grand piano holds court in front of the large, streetside storefront window. Alongside rentals, they also donate the usage of the adjacent kitchen to the local Food Not Bombs chapter, who prepares and distributes food via the alleyway behind the building over the winter months. Their fall season wound down with a major success; in November of 2009 they earned their 501c3 status, making Rumble eligible for grants and entitled to bypass sales tax. The organization also invests a lot in their students, fostering growth from within as students go on to volunteer and sometime teach classes. It's not uncommon for collaboration and learning to take place horizontally too, as many teachers drop in to take other teachers' classes. The center is always accepting class and programming proposals, and lets the community's enthusiasm determine an offering's longevity. 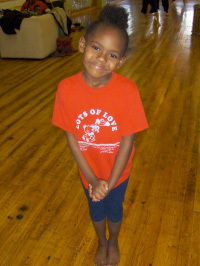 One such class is African Drum & Dance, taught by Markeya Howard and Da'vid Braswell. Both were born and raised in Chicago, and Howard drew her inspiration in developing the class from her interest in showing students how popular contemporary dances, such as Stepping and other types of footwork, have their roots in African dance. According to Howard, "Drumming and dancing go together. You can't have one without the other." So while she instructs students in the Funga dance of Liberia, a welcome dance that illustrates hospitality by movements made with the hands from the heart to the mouth, Braswell works with students pounding out rhythms that literally shake the room on their Djembe drums. The symbiotic relationship that exists between Howard, Braswell and the Rumble Arts Center is built on a foundation of trust and a belief in reciprocity; Rumble supports their complete creative control thanks to their programming's alignment with the center's mission, and they work with the community they most want to impact. As a bonus, the instructors find they are often better compensated at Rumble than in their additional professional employment, despite the sliding scale donation-based model the center employs. Rumble's remarkable progress to date has largely been sustained by similarly symbiotic relationships, such as a dedicated and multiplying number of chiefly volunteer staff, including 23 volunteer teachers; interns receiving enrichment or course credits from local colleges and universities such as DePaul, The School of the Art Institute and UIC; a small handful of CPD-vetted victimless crime offenders doing community service hours; and religious groups bussed in to do days of service. Until now, Rumble's expansion has happened organically, through word of mouth getting around artistic circles and like-minded DIY organizations as well as through peer to peer recommendations from community members who are also teachers or students of the Arts Center. Rumble is poised on the brink of a benchmark moment as Wolfe's efforts to build a solid board of directors come to fruition, strengthening networks within the not for profit arts and culture community and tapping into financial support from individual and organizational philanthropic entities. Whether the official channels they're beginning to travel result in expansion, or simply stability, its staff and students continue to define what success means to them, one rippling rumble at a time. This Saturday, April 3 from 11am to 4pm, visit Rumble Arts Center for the free Mercadito Craft Fair, featuring a local DJ, food, and work for sale by 24 vendors from the Humboldt Park, Logan Square and Ukrainian Village neighborhoods, who will demonstrate their art- and craft-making process on-site; a trunk show by fashion design students who will create and alter clothing during the event; and a showcase of Rumble's teachers and students performing dances, playing music and displaying artwork they have created in their classes. Photos and video by the author. This feature is supported in part by a Community News Matters grant from The Chicago Community Trust and the John S. and James L. Knight Foundation.